STUCK ON A GREAT FESTIVE GIFT? WELL HERE’S A HOMEMADE GRAIN-FREE VEGAN GINGERBREAD COOKIE JAR FOR YOU! What is the only thing better than a delicious, homemade ginger cookie? A whole jar of them! The aromas that permeate through the home, the notion of getting into the kitchen to create such a thoughtful gift, and of course – the beautiful festive outcome: gingery, cinnamony, coconuty goodness. In a large bowl, sieve the dry ingredients together. In a separate bowl whisk the wet ingredients until well combined. Combine your wet mixture to the dry mixture together and mix until it starts to look like wet sand. Using your hands press the mixture firmly together to form a dough. And let rest for 5 minutes. Firmly roll out and press down the dough until it’s about 5mm thick. Now you can cut out your cookie shapes using festive cookie cutters. Line a baking tray with greaseproof paper, and bake the cookies for 10 minutes. Remove from the oven and allow to cool completely before icing. ICING: add the coconut cream to the icing sugar until you have a consistency that is runny enough to pipe, but not completely liquid. Scoop the icing into a piping bag and unleash your inner festive Picasso. There is no right or wrong way to decorate a Christmas cookie. 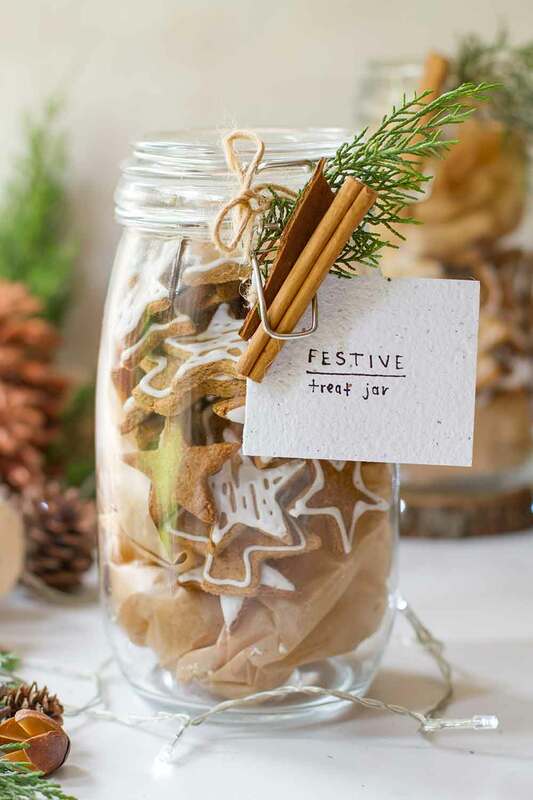 Let the icing set overnight at room temperature before storing in a glass jar to gift to your loved one.